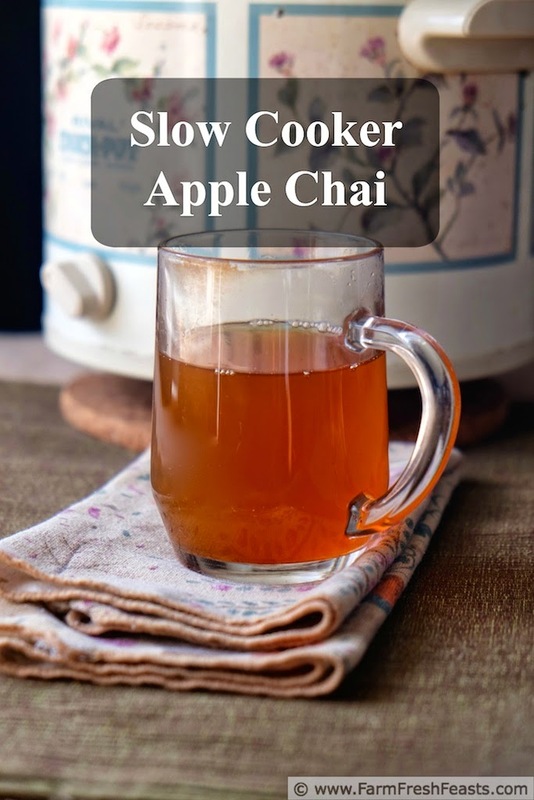 Warm apple chai tea, easy to serve from a slow cooker and plenty for a crowd. 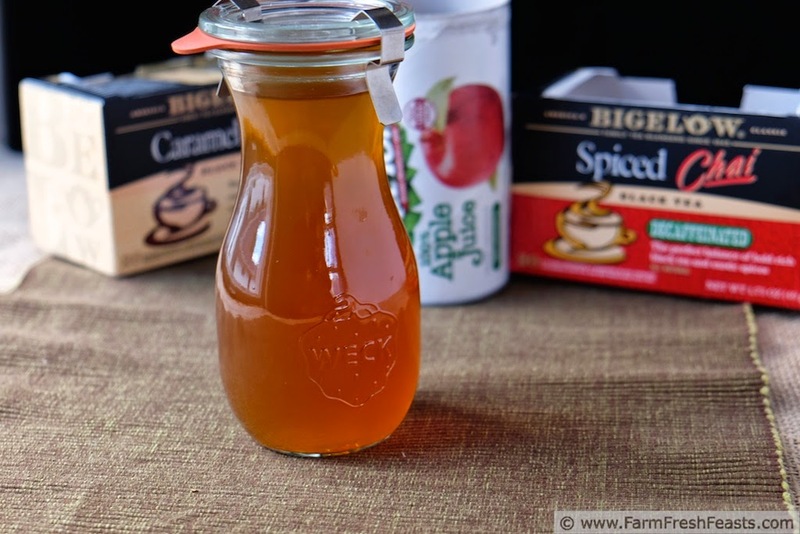 This DIY Apple Chai recipe keeps in the fridge for single servings too. In an online food blogger group we've been discussing recipe testing. From cookbook author/bloggers to 'here's what I ate today' bloggers, everyone has an opinion and we're not afraid to share it! It's been an interesting discussion. With a recipe posting schedule of Monday, Wednesday and Friday (12 to 13 posts/month) I've got flexibility in what I choose to post. Let's take the past 24 hours as an example. I hosted a book group in my house yesterday and served Asian Pear Cardamom Cream Muffins, Asian Pear & Pear Butter Soaked Oat Muffins, Sweet Potato, Turkey Sausage & Gouda Breakfast Casserole, Sweet Potato, Hatch Chile, Cornbread & Queso Breakfast Casserole, sliced apples with Apple Cream Cheese Toffee Dip, and Slow Cooker Apple Chai. Are the recipes on the blog yet? Um, no! I just got the dishes done! The rest will appear when it's seasonal [Hatch chiles in August, and when do Asian pears appear in the stores?]. That's 6 recipes, or 2 weeks worth of blog posts [and about 6-7 hours of food preparation, 81 photos that need to be edited, 3 sinks full of dishes to be hand washed, an additional dishwasher load, 2 extra trips to the grocery store, and plenty of writing and typing as that's part of my process. Though if we're talking hours, I started thinking about what vegetables from our Community Supported Agriculture (CSA) farm share I'd have to use up--and what would go over best with my guests--about a week ago and mentally walked though the muffins and casseroles a few times before picking up a knife. I've been hacking at just this post all afternoon/evening, too, in between band fruit fundraiser captain meetings and AFO fittings, and in lieu of reading a book or watching TV. We all make choices on how to spend our 24 hours, and this is how I choose to spend mine]. The recipes that I share on this blog are what my family [and my book group, and my coworkers, and the high school marching band] eats each week. If it works and I have good notes on ingredient amounts and cook time, I won't make it again. [I mean, while we enjoyed Beef Tongue Nachos and Caramel Toffee Apple Parfaits I'm not going to serve them 4 times just to make sure the first 3 weren't flukes.] If a recipe doesn't work--it doesn't appear on this blog. Period. Failure photos do make it to my FB page, however. We're all human--except the spambots. Sometimes I'll need to tweak things a bit, like I did with the Double Chocolate Raspberry Muffins. Sometimes the recipe testing can go too far and I just need to stop the madness and put it on the blog already. Too hot for warm chai? Can I interest you in my DIY Iced Chai Tea Latte Instead? 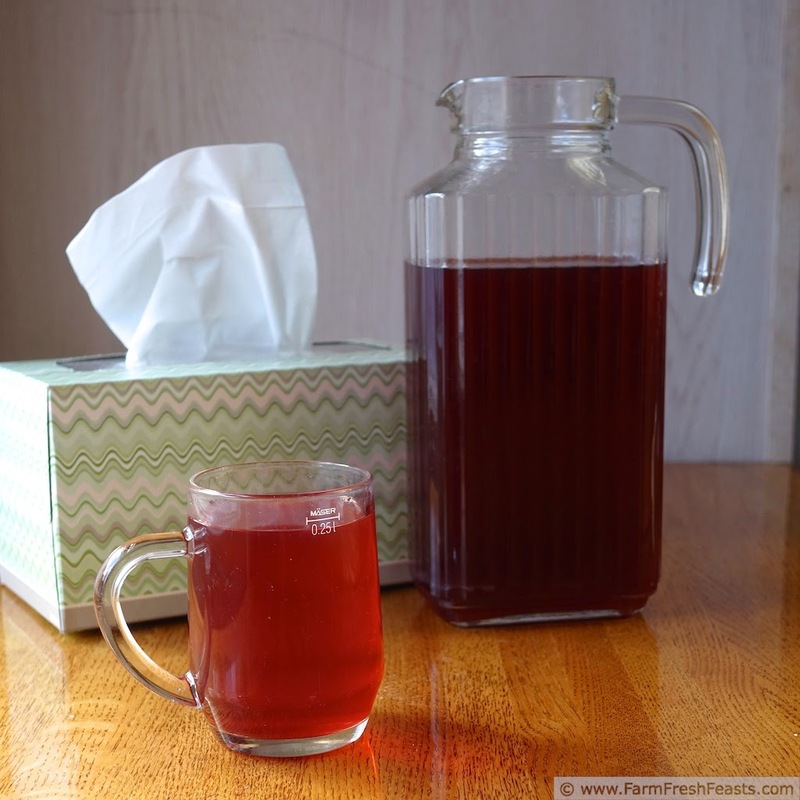 Shown is a version using cranberry apple juice concentrate. I first started testing the recipe for this drink last winter after I had some at a coffee shop while waiting for my daughter to finish sewing class. I was feeling run down, and a warm cup of apple chai tea was cozy and soothing. I resolved to DIY the Apple Chai. I made it at home with apple juice concentrate. I made it with cranberry-apple juice concentrate. I made it with bottled (ready to drink) apple juice. I made it with apple cider. I prefer either of the concentrates because I like a clear finished product, though apple cider chai--aka chaider--tastes great. For the chai I used caramel chai, vanilla chai, regular and decaf spiced chai. I prefer a combo of the caramel and spiced. I've tried rations of chai to juice ranging from 1:1 on up to 1:4. If your chai is strong enough, you can use 1:1 but if not, the whole thing just tastes weak. 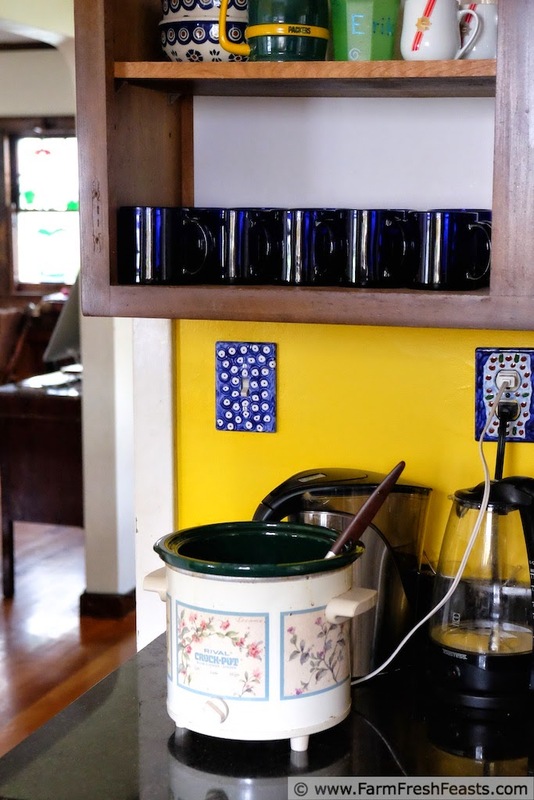 Serving out of the slow cooker was simple--mugs on the shelf above. After all of this testing, I'm just going to share how I made this particular batch. It's great for a crowd--or for those times when a single soul needs some soothing. Assemble this all in a crock pot--no extra dishes. Store leftovers in snazzy juice canning jars the fridge for a few days, warming a cup in the microwave or on the stovetop as needed. 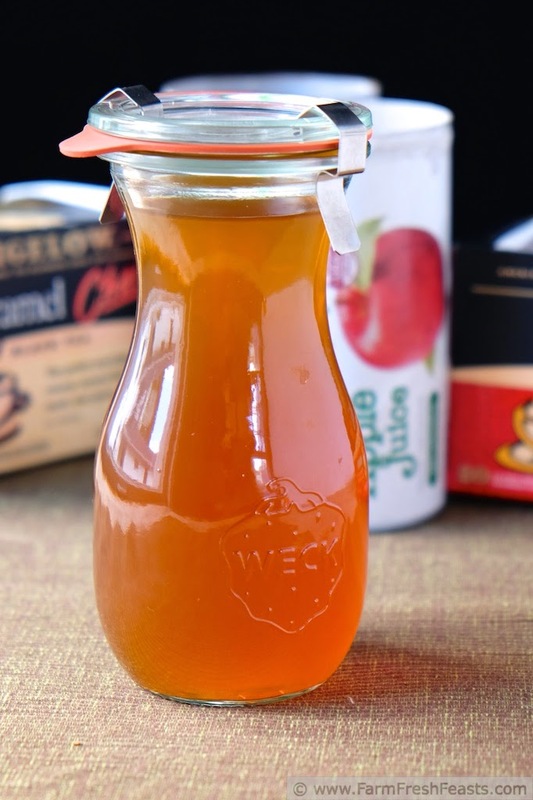 This recipe makes about 3 quarts and keeps in the fridge a few days. In a 3 quart slow cooker, set to High, steep the tea bags in 2 quarts hot water for 15 minutes. Remove tea bags (worms love this, so does your outdoor compost bin or overwintering garden bed). Pour in apple juice concentrate, then fill up 1 can with water and rinse out both cans, pouring the water into the crock pot. Cover and let it go for an hour, then turn it down to Low for serving. If you are starting with cold water, I'd steep for up to an hour, or just bomb everything in and turn it on High for an hour and see how it turns out. Let me know. For the record--I didn't can this. I just figured it would look cute in my new juice jars and I'd taken all my quart canning jars down to the basement to clean up for my guests. Also for the record, even though you can see the brand names of what I bought to make this tea, there is no sponsorship implied. I'm just no really into blurring out brand names or making fake brand tags. I bought that. I used it. OK, now I would like to be in your book club. That menu sounds great! And so does this tea... Keeping it in mind for the next event that needs a warm beverage! This book club is pretty fun! I won't even try to decorate according to theme--I really don't have that talent, but everybody hosts us well and it's enjoyable to discuss the books each month. And we do discuss books! This looks wonderful...I have to try it! What a great idea...thanks for sharing! I'm glad to have cracked the code for it and hope everyone will enjoy it like we do. Thanks! Kirsten, what a great way to have a beverage handy for unexpected visitors! Thanks for stopping by our Happy Holidays Link Party - be sure to join us again this week (beginning on Saturday at 7 pm ET) and every week through the holidays. Thanks for hosting, I'm glad to join your party! It's super cold today and I think I'll make another batch to warm us up--decaf so we can all sip it all evening. I'm glad to make you lol about the non product endorsement--I write these things and wonder if anyone else catches it! What is the ratio of water and apple cider , if you use apple cider? My local grocery didn't have apple concentrate. In the recipe above I made a strong tea and combined it with a strong (not very diluted) apple juice. Using apple cider would mean you need to concentrate the tea more so that the whole blend isn't diluted. 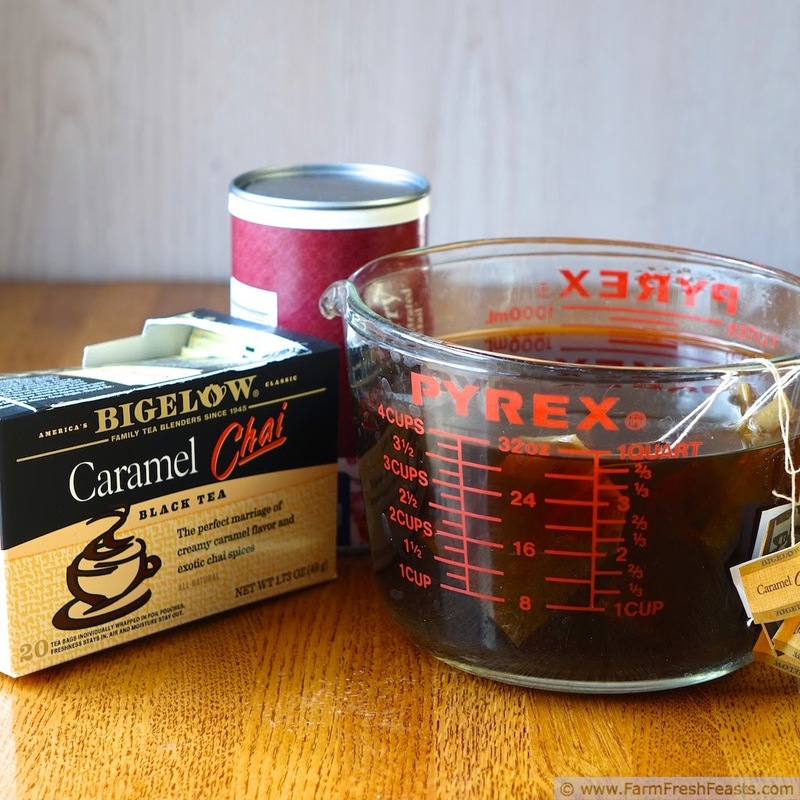 I think I'd steep the tea bags in a single quart of water to make a super concentrated tea mixture, then use 2 quarts of apple cider instead of the apple juice concentrate + water. So 1 quart water + 12 tea bags to steep, then combine with 2 quarts apple cider to heat. The kids and I will try this over the break and circle back.